Not sure of the year of this and the location looks like outside the town hall ? Interests:Making this place the best of its kind. Free, polite, helpful. Your input requested via comments, questions, photos, memories etc. You are correct on the year 1905. In fact May 11 1905 to be exact. The picture is of the official unveiling of the "Victoria Monument" by HRH Princess Beatrice of Battenburg in the town hall square (The junction of Leopold Street & Fargate) . 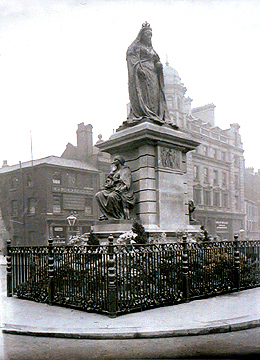 The Monument was the work of Alfred Turner (1874-1940) is made of bronze and was commisioned by public subscription. It stood there until 1930 when it was resited to Endcliffe Park where it sits to this day. Does anyone know why it was moved? It was frightening the kids in town !!! 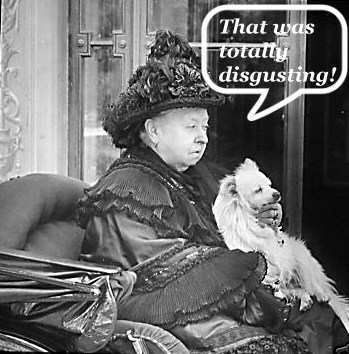 as at that time the lower classes didn't understand Aristocracy. So it was taken to an upper class area where the people and children would appreciate it. Yes, Queen Vic now frequents Endcliffe park. It seems to have been a convenient 'parking place' for monuments moved from outside the Town Hall, the obelisk further up the park came from the same place, commemorating Victoria's jubilee. 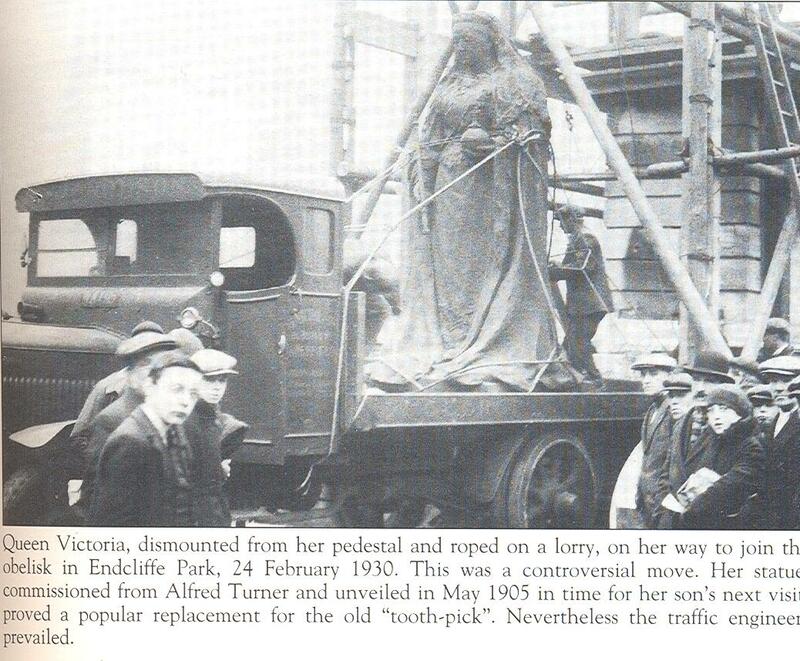 The obelisk was moved to Endcliffe in 1903 to make way for the grand lady herself. She was 'moved along' in 1930 to make way for traffic improvements! 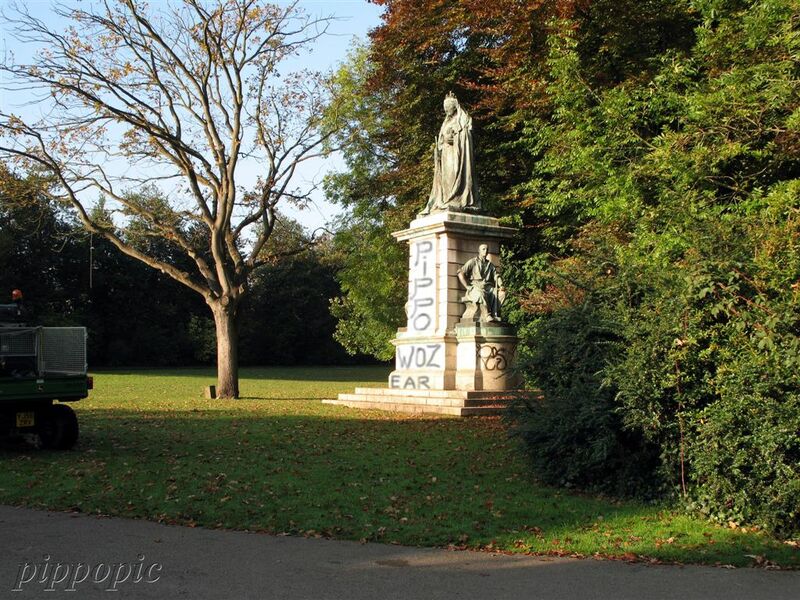 Yes, Queen Vic now frequents Endcliffe park. It seems to have been a convenient 'parking place' for monuments moved form outside the Town Hall, the obelisk further up the park came form the same place, commemorating Victoria's jubilee. 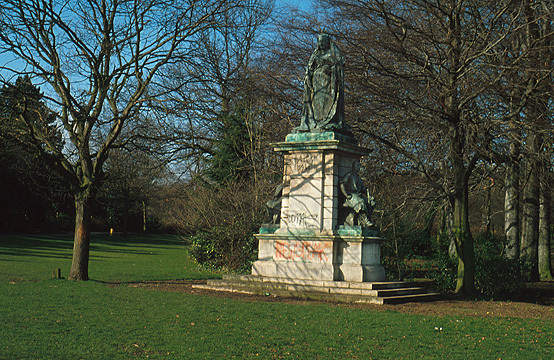 The obelisk was moved to Endcliffe in 1903 to make way for the grand lady herself. She was 'moved along' in 1930 to make way for traffic improvements! 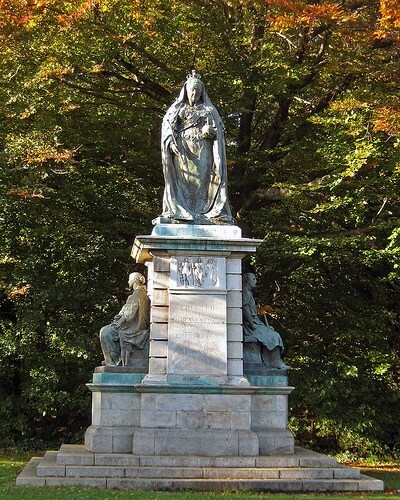 Who are the two figures one either side of Queen Vic ? 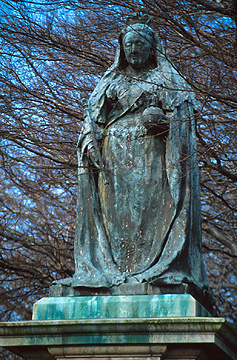 "The bronze figure of a crowned Queen Victoria holding an orb and sceptre stands on top of a plinth of limestone blocks. The figure is about 3m high. She is attended by two bronze figures representing Maternity and Labour seated on either side of the main plinth, each about 2m high. 'Maternity' is a young woman holding a baby with her left arm around a young girl . 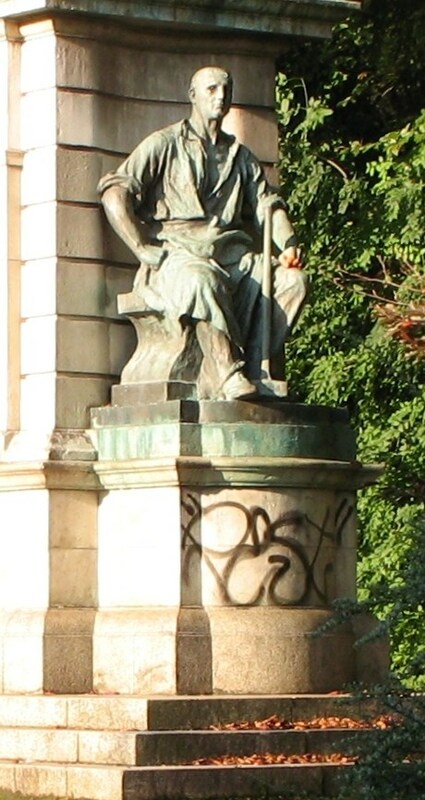 'Labour' is a young man sitting on an anvil with a sledgehammer propped against his left knee. The base of this bronze is signed: "ALFRED TURNER SC. 1904" - the '4' is somewhat indistinct. " This page has close-ups of the 'attendants' and other images. That one was moved to the botanical gardens, gramps, :- well, the base and the Statue of Victoria, sans column, but about 4 years ago, there was a refurb in that area of the Gardens, and I STR that the statue was moved (again), but I don't know where to (shame on me:- it's that long since I have been in the beautiful "Botanicals"! That's right. The statue from the Botanical Gardens was put in store. When it was moved from the middle of town, the column was split into sections and put in a children's playground to be climbed on. 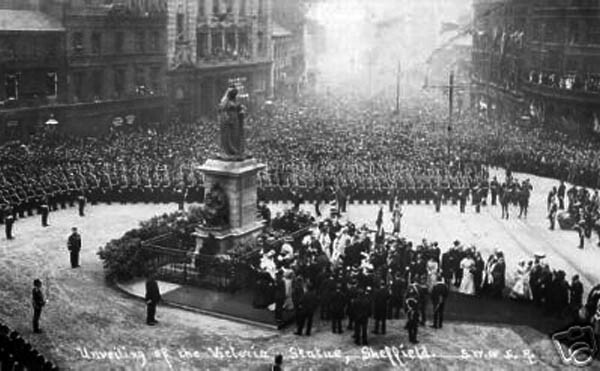 I understand the plan is to re-erect the whole thing in the city centre again, perhaps close to the war memorial in Barker's Pool, but no-one can decide quite where it should go.